The Surface Pro at work: Can it be a full PC replacement? Enterprise has long been slow to change and has traditionally dragged its heels when it comes to adopting new ways of working, but times are changing rapidly. Workers are demanding the ability to be more mobile and they’re spending less time chained to a desk. It’s a shock to the system for many organizations, but a great change. 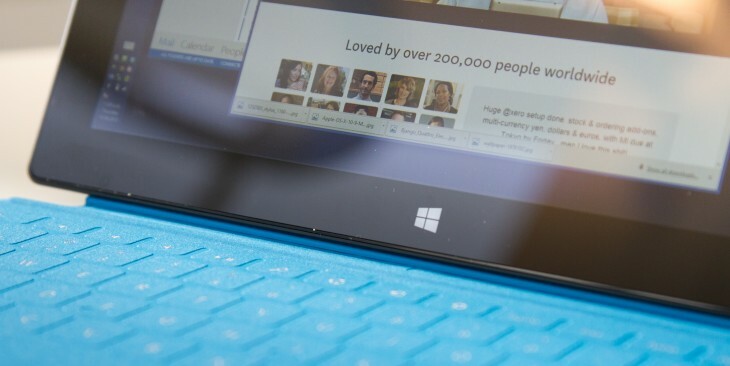 The Microsoft Surface Pro is one of many devices that is changing that attitude. Historically, most of us have been subjected to either only having a desktop PC at work or are given a laptop as well to use on the go if we need it. Even then, for a long time laptops were big, unwieldy devices that weren’t exactly ‘portable’ and were considered to be significantly less powerful than their desktop counterparts. The table has finally turned with the advent of Ultrabooks. When the Surface Pro was released in New Zealand, I decided to jump head first into a world where I don’t have a desktop or even a powerful laptop anymore but instead work off a tiny 10.6″ device. To give a little bit of context, I work in the operations team as an Infrastructure Engineer at a fantastic company called Xero. We’re a young company, based out of Wellington, New Zealand but have offices around the world. Xero builds beautiful accounting software online, so naturally we believe that it should be possible to do accounting on any device, anywhere, not just from a desk in an office. We’re always looking at better ways to work (as should any business) and the Surface Pro presents a brand new opportunity to look at how the idea of working on an ultra portable device full time could actually work. My job involves being up to date pretty much every moment of the day; monitoring systems that make our platform tick and responding to alerts as they come in as well as keeping our developers happy, so being able to carry my device and emails with me everywhere I go is incredibly useful and makes it easier to deal with things as they come in rather than catching up (and drowning in email) every time I go away from and come back to my desk. It makes a huge difference being able to respond to an issue on the spot when your PC never leaves your side. I’m two and a half weeks into a month long experiment in which I put my PC away and try using the Surface Pro full time. The Surface just looks like any other tablet from far away, but the power of being able to run any Windows application is much more compelling than I thought it would be. I’ll be honest, if I was given a Surface Pro and a desk to work at for my job I’d be a bit upset. While the display on the Surface is beautiful (coming in at 1920×1080 on a 10.6” display) it’s a bit small to get any real work done without ending up with headaches from squinting. That said, to work on the device full time — as well as comfortably — I have managed to find what I believe to be the perfect solution. The Surface only has one USB 3.0 port, but luckily over the last few months USB docks with video out ports have become readily available. I picked up a HP 3005pr which has a DVI port, HDMI, a gigabit network port, four USB 2.0 ports, and sound in/out. Somehow, this all works over a single USB port which is amazing in itself. This means I am able to plug in two 1080p external monitors (I could even do three if I used the built in mini-Displayport plug on the Surface) as well as network and my mouse with just one USB port. Every time I’m away and come back to my desk it’s simple to just plug in the Surface and keep working. Being portable is important to most people these days. At home, most people either have a laptop or tablet they take almost everywhere with them and in a world where bringing your own device to work isn’t such a strange concept anymore, we expect the same at work. Having a device that is as portable as the Surface Pro makes a world of difference for a number of reasons. Not only that, but it being a fully blown Windows computer in such a small package is extremely freeing and is a breath of fresh air. It’s so easy to just pick it and take it anywhere with me. Yes, it’s a chubby tablet, but it’s excusable for the amount of freedom it gives you. Unlike my laptop, which didn’t go many places with me, I took the Surface to meetings, coffee catch ups and pretty much everywhere else I went. It ultimately ended up even replacing my physical notebook, despite my reservations about the stylus being a bit old school it’s quite nice to take notes directly on the device I use for everything. Now I can’t just lose all that paper! It was a large talking point, too, with many people I met remarking how interesting the Surface looks and their reaction when I told them it was my entire work PC was always priceless. When on the go it’s a pleasure to use thanks to that high resolution screen, too. So many business grade laptops come with sub-par displays (generally something like 1366×768) that are frustratingly bad and ultimately leaves little room to work in. The ability just pull off the keyboard and go properly mobile is quite useful, especially in meetings where having a laptop propped up in front of you is actually quite rude. For when I’m away from my desk I’ve got both the touch and type versions of the keyboard and if anyone was to ask me which I prefer, I’d enthusiastically say ‘both!’ The touch is a great keyboard for when you’re not planning on doing a lot of typing (it’s definitely got a learning curve but it does grow on you) whereas the type is great for those emails that end up more like novels. In fact, this article was written from my Surface on its own with only the type keyboard. The small, but useful, trackpad on both keyboards is augmented nicely by being able to interact directly with elements on the screen with touch. I’d say that’s part of the magic – being able to just directly tap an element on the screen it becomes leagues more natural to interact with a computer. Why would you drag a mouse around when you can just tap on what you want to use? The media seems to paint a strange picture about this, they think it’s too hard to reach over the keyboard and touch the screen. Quotes like “Reaching over to a touchscreen is too difficult, and too imprecise” from PC World make it seem like touch doesn’t make any sense, but I disagree. When you’re presented with either touch or using a trackpad sometimes tapping things on the screen just makes a heap more sense and is considerably more natural than using a mouse. Having the full version of Windows makes it pretty powerful. I can use lots of desktop applications at once, as well as Metro based ones if I want to. I loved being able to run any desktop app I please, like Outlook and Spotify, just like on any other PC. It feels strange running them on a tablet, but it’s extremely useful. Windows 8 makes so much more sense when touch is involved. I often find myself working on the desktop with a chat window or my email attached on the side of my screen. I’ve never been sure about how touch would fit into my workflow, but just having a touch application snapped on the side of the screen makes for interesting habit changes. I’ll be working, replying to email and a chat might come through on Lync, so I’ll touch the screen to snap the chat on the side instead of using the mouse. As for performance, the Surface Pro certainly doesn’t leave me wanting, even as someone who runs virtual machines and often has a significant number of applications running. It doesn’t seem to miss a beat, even when powering those external screens on top of everything else and doesn’t create an obnoxious (or even noticeable) amount of fan noise when cooling itself unlike many business laptops (I’m looking at you, HP). My only complaint would be that there aren’t models with a bit more RAM right now, but your average user wouldn’t really need more than 4GB for the most part. The hardware is a little strange, being one part super-light, portable ultrabook (it’s just 910g) but also being other part slightly bulky and overweight tablet. Perhaps it was slightly ahead off its time and now that Haswell based processors are in the wild it’ll be updated to be considerably smaller and lighter. In my opinion, it’s worth it right now for the weight and slightly thicker size simply because I’m able to do anything on it. There’s a one big disadvantage of being part tablet and part ultrabook which comes down to the way that the device holds itself up. It’s got one angle and only one for on a flat surface, so if you want to angle it any other way you’ll need to hold it yourself. It’s not a problem in most cases, but if you were to want to use the Surface on the couch or in an armchair, you have to disconnect the keyboard and go into tablet mode. Unfortunately some of these freedoms come with bad sides. The Surface Pro is an all round good device but because Windows 8 is such a version one touch product, it’s really not great in a lot of cases. The first and biggest issue I had with it is when it comes to DPI scaling. Because the pixel density is so high on the Surface, Windows uses DPI scaling to scale elements large enough to read on such a small screen. This works adequately on its own, but when you plug in external screens it becomes an issue. Windows isn’t smart enough to scale per screen yet, so the external screens get that scaling too, making elements large and stretched in some cases. Unfortunately for Windows, it’s never been particularly great at scaling things either. Lots of applications do really unexpected things and somehow Chrome ignores DPI altogether on Windows despite being one of the more major applications that you’re likely to use. Not strictly Microsoft’s fault, but Windows developers really need to step up their game here. I’ve been running the Surface Pro at 100% DPI, meaning that things can often look extremely tiny and are a little hard to read. Even worse, it makes touch on the desktop even harder, since things like the button to close a window much harder to hit with your finger. Not impossible, just difficult. The other disappointing thing about the Surface line of devices in general is that there’s no 3G/LTE out of the box. These devices are marketed as always-connected devices which keep you up to date with your life, but you can’t be online all the time without this. It would make much more sense if the device could be online all the time, but at least it’s compatible with USB modems for now. I’d guess that future versions of the Surface will have a 3G option, just like the iPad does, but Microsoft didn’t want to have to go through the certification process and slow down this round of devices. There’s a bigger problem with the Surface Pro, though. As much as I can praise Microsoft for thinking outside of the box, I fear the approach may not be working as well as intended when it comes to touch friendly applications (‘Modern’ applications). This isn’t inherently a Surface problem, but it affects how useful the device is. Windows 8 has been available for around nine months and in that time, it doesn’t seem that more than a handful of quality Modern applications have emerged. There are some corporate ones there — like Lync — which are pretty useful but actually don’t work some of the time. Hunting through the store for quality is very hard and there just isn’t much there. It worries me that this far on, there are so few applications that are useful. Windows is a major platform player and I thought that by now the market would have caught on more. It still gets stranger, though, as Microsoft is yet to release a proper touch-friendly version of Office 2013. The current version has ‘touch mode’ but all it does is slightly space out the elements and rearrange them for the screen size. The applications are good enough for now, but I do wonder just how much more useful it would be to have a fully Modern style Office suite. I just can’t fathom why there isn’t even a preview version of this available yet. My final issue with the device is the onscreen keyboard. It’s not very good and makes using the Surface in tablet mode far more difficult than it needs to be; it’s oversized and not particularly good at recognizing what you’re trying to type. Autocomplete seems to be essentially non-existent and the keyboard doesn’t even suggest as you type, which has come to be expected on mobile devices. A lot of the issues I have with the Surface Pro are likely to be solved later this month with the release of the Windows 8.1 preview. Most of the issues above are being remedied and the OS is slowly becoming more consistent with Windows Phone 8. The high-DPI issue with external screens is apparently resolved and the OS now lets you choose per screen, which resolves my biggest annoyance with the device. The keyboard is getting some love too, with auto-updating suggestions and better prediction as well as a bunch of other touch enhancements. There’s a plethora of other great enhancements too, like more sizing options for tiles on the start screen, the ability to sync the start screen layout across devices and ‘old’ Windows applications won’t add to the start screen and spam it anymore. All in all, I think the Surface Pro will become the ultimate work computer when this update is available. I wouldn’t hesitate to recommend to businesses that are looking for ways to get their staff more mobile that they invest in the Surface lineup. This is the first time I’ve ever considered a tablet to be able to replace my entire workflow and it looks like it’ll be the perfect tablet in a few weeks time. We’ll revisit when Windows 8.1 is released and look at how it enhances the Surface Pro at work.